The name Thuensum literally means Match/Coordinate 3. The name signifies the combination of 3 signs from the 12 Bhutanese birth signs and such combination predicts achievement, prosperity and fame. 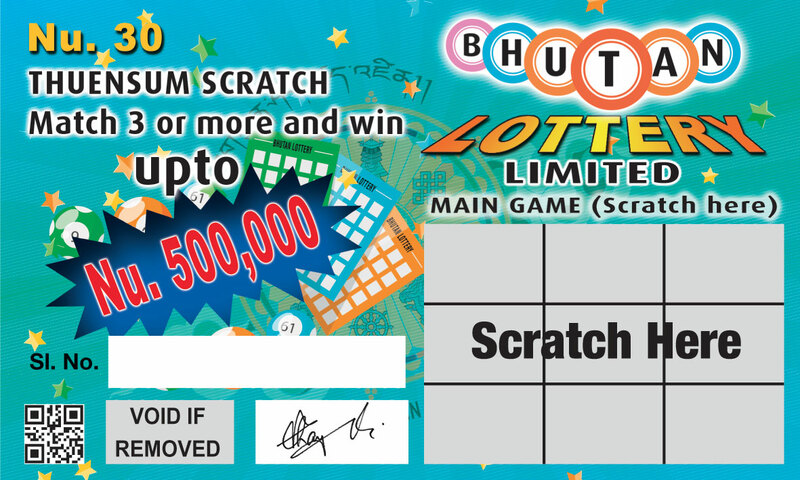 Thuensum Scratch is a form of pre printed Scratch and Win lottery. It is a figure matching game, where buyers match 3 or more figures and win some amount. 200,000 Scratchcards are printed per scheme at Nu. 30 per Scratchcard and buyers can win up to Nu. 500,000. This product has been launched in order to provide our buyers a platform for entertainment in addition to their chances of winning. Thuensum Quick Cash was introduced as a subsidiary product to Thuensum Scratch at cheaper price. It is also figure matching game, where buyers match 3 or more figures and win some amount up to Nu. 100,000 as the top prize. 800,000 Scratchcards are printed per scheme at Nu. 20 per scratchcard. This product also provides our buyers high chances of winning at cheaper rate. Phuensum Mid-Dharim is a form of traditional paper lottery. It is a fortnightly scheme with 100,000 tickets printed per game at a price of Nu. 40 per tickets. The prizes category ranges from Nu. 500,000 (five lakhs) as the top prize to Nu. 100. The draw is conducted at interval of every 15 days.